February 2006. Boston Massachusetts. Legal Seafood. I had the best salad of my life. On the take out menu, which I have saved to this day, it is called the tortilla, apple, and goat cheese salad, with scallops and chopped avacado in an chipotle orange dressing. I have never forgotten the divinity that was that salad. My newly-invented imitation of that dressing is not quite right, but it's still pretty darn good. 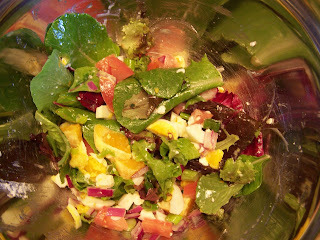 Today I enjoyed it over mixed greens, tomato, red onion, green onion, oranges, goat cheese, and egg. Mmmmmmm! Combine all ingredients in a bottle and shake to combine. Can be stored in the refridgerator - I don't know for how long, because it doesn't stick around long enough to go bad. Yummy! I love inventive salads - I could live on salad! I am excited about grocery shopping too, it amazes and scares many people.